When we think about strength training, we tend to refer to the process of building muscle mass. It may involve lifting a barbell to build biceps or using a Smith machine or a pec-deck to increase the size and strength of your chest muscles. The actual process of "pushing" or "lifting" in these exercises involves an action known as a concentric muscle contraction. By definition, a concentric contraction is one in which the tension on a muscle increase as it shortens. Concentric contractions are a central aspect of the growth and development of muscles. As muscle contracts, they begin the process of hypertrophy ("hyper" meaning increased and "trophy" meaning growth). With muscle hypertrophy, each muscle cell will grow under the influence of consistent stress. The muscle fibers themselves, known as myofibrils, will also split and increase muscle mass. 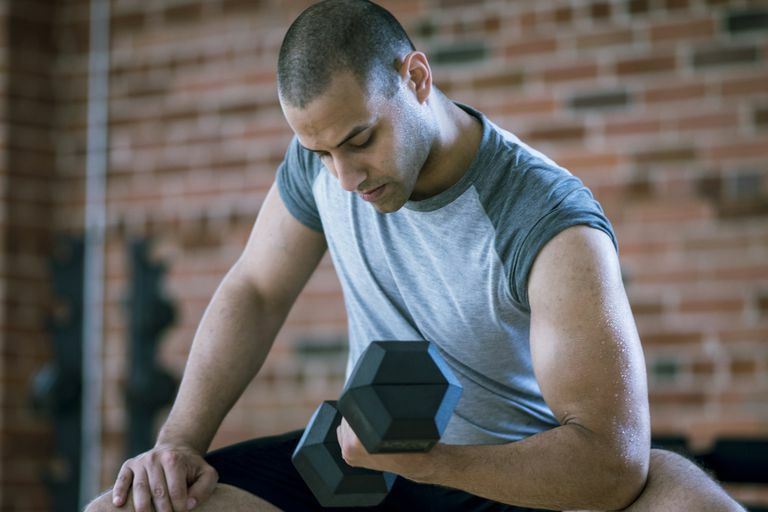 Although concentric contractions are vital to achieving growth, they are only one type of contraction that the body relies upon to build muscles. A simple way to visualize a concentric muscle contraction is to do a biceps curl with a dumbbell. As you raise the dumbbell from the full-extended (downward) position toward the shoulder, you will see the biceps muscle being activated. In daily life, any upward or lifting movement would involve a concentric muscle movement. The same applies to any movement in which a muscle has to work against gravity. This includes sprinting, running uphill, cycling, climbing stairs, and just getting up out of a chair, all of which cause the quadriceps to contract concentrically. Even carrying a baby in your arms would involve concentric movement as the biceps and forearm need to contract and shorten in order to bear the weight. While concentric movements are effective in building muscle mass, eccentric movements can contribute if you maintain steady control and tension throughout the movement (rather than just "dropping" the weight). Similarly, by maintaining steady control during the concentric movement (rather than "jerking" the weight), you can build muscle much more effectively. Increasing muscle mass and strength is a complex physiologic process that requires both muscle activation and rest. A concentric muscle contraction is one of the three types of activation. The other two are eccentric muscle contractions and isometric muscle contractions. Isometric contractions differ from the other two types in that it does not involve either the lengthening or contraction of muscles. Rather, it is a type of activation in which the muscle is consciously tensed but the associated joints are not moved. Examples include carrying an object in front of you without moving, sitting in a squat position against the wall without moving, or holding yourself in a plank position for a minute or two. In each case, the muscle is activated without movement. Although concentric contractions are central to building muscle mass, eccentric and isometric activations should also be utilized to build muscle in a more cohesive way. Building mass should not be the only aim. You will also want to build downward flexibility and strength (which eccentric movements accommodate) and increase muscle endurance (which isometric exercises can provide). Focusing on concentric contractions alone can cause wear and tear on the joints and may lead to an overuse injury. By contrast, isometric exercises can extend the life of a joint and can even be employed to aid in the recovering from an injury. Similarly, controlled eccentric movements are protective in that they strengthen the weight-bearing muscles around a joint. If you are uncertain how to design a workout that involves concentric, eccentric, and isometric movements, speak with a physical trainer or kinesiologist.